Views of the San Francisco Peaks, the volcanic fields east of Flagstaff, Sunset Crater and even the Painted Desert are yours to enjoy along this high country trail. The route starts near Schultz Tank, a rare body of water here in these mountains Spanish explorers called sin agua (without water). It then climbs gradually to a high ridge where you'll find good views of Arizona's tallest mountain before continuing on to the east edge of Mount Elden's summit plateau. From this high perspective you can look down on Sunset Crater and the huge Bonito Lava Flow that borders it. As you hike along this trail, take time out to check for black bear tracks in the dust. A few of these shy animals live in this area but usually all you see of them are their tracks. You have a much better chance of seeing elk and mule deer which are more plentiful and much less shy. Along its highest reaches, the Sunset Trail traverses an area devastated by a fierce wildfire in 1977. At one point there was concern that the city of Flagstaff might even be consumed by this campfire gone wild. Here, among the burned out hulks of a once thriving forest you can see how nature recovers from such an all-consuming disaster. Pioneer plants such as aspen and Gambel oaks are already well established in the burned-over area. 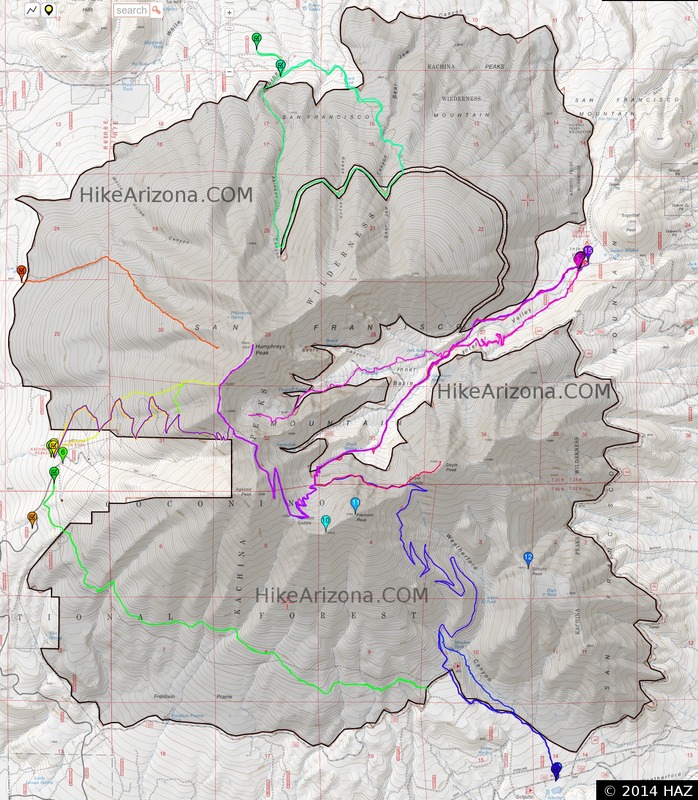 Sunset Trail provides a connecting route to Schultz Creek, Brookbank, Little Bear Trail, Upper Oldham, and Elden Lookout Trails. Location: 7 miles north of Flagstaff on graveled Forest Roads. Access: Drive north out of Flagstaff on US 180 to FR 420 (Schultz Pass Road). Drive 6 miles east on FR 420 to the trailhead at a parking lot on the south side of the road. Road Condition: FR 420 is graveled and suitable for passenger cars except during winter when it is closed because of snowpack.